72 bulls av $5794 top $16,000 100 percent clearance. 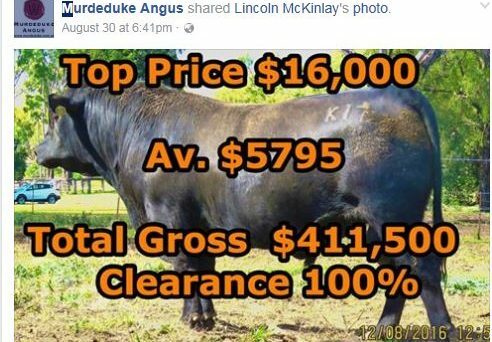 A complete clearance, a market top of $16,000 and bottom line average of $5794 were the standouts at Tuesday’s annual Murdeduke Angus Sale, CQLX, Gracemere. The Winchelsea, Victorian based operation, saw bulls sell to all parts of central Queensland for interstate for owners, the Wilson family. Top seller was the $16,000 26-month-old, Murdeduke Knockout K019 (AI) (ET) an 845kg, 114EMA 7.2IMF son of the $91,000 Te Mania Emperor (AI) and from a Te Mania Ada female selling to the Graeme Carige, Wandoo, Baralaba. Allan Stevenson and family, Spring Creek, Springsure took a pair to average them $11,500 topping at $14,000 for Murdeduke Kale K071 (AI) (Emperor) (24-months). Another high seller was the $13,500 Murdeduke K107 (AI) (ET) (Rennylea Edmund (AI) (ET)) selling to return client Peter Howard, Nogoa Pastoral Company, Duckponds, Emerald. The bull was a flush brother to the top priced bull, CSWK18, at our 2016 autumn sale selling to Peake Angus, Narrabri NSW. Landmark Rockhampton acting for an undisclosed buyer accounted for 20 head (28 percent of the offering) topping ay $7500 to average $5300. Top of their selections at $7500 was a 24-month-old by Milwillah Gatsby. Another feature of the offering were 18 sons (25 percent of the catalogue) of the prefixes leading sire, the $91,000 Te Mania Emperor. These found favour with buyers with his progeny taking top and second top sale honours to end with a $6722 sale average, $928 per head above the sale medium. Busby Cattle Company, Yarwun selected six to average them $5000 topping at $7000 while the success of last year’s selection prompted Yeppon cattle producer Malvern Developments to sign off on another nine bulls this year for an average of $3944. Neville Edwards, Coorumbene, Rolleston took a $5000 Ardrossan Equator (AI) (ET) 23-month-old while at the same money Ian and Anne Lamb, Parraweena, Banana selected a $5000 son of Emperor. Marlborough producers, Peter and Rosalee Shannon, Mt Bison purchased a pair at on average $7500 with fellow district graziers, the Purcell family, Yatton, selecting four for on average $5250. Top seller in the Yatton draft was a $6000 Emperor son. The Pensini Grazing Company, Cameron Downs, Hughenden acting through Shane Stafford Stock and Cattle, Richmond took four to average them $5875 topping at $7000. Darryl Ahern, Rosedale, Baralaba outlaid $7000 for an Equator son while Allen Pastoral, Oakvale, Mitchell picked up a pair to average them $4000. Agents: TopX, Elders and Elite Livestock Auctions. Murdeduke Agriculture Pty Ltd 730 Cressy Road, Winchelsea Victoria, 3241, Australia.